Thank you for your mail with al the photos. It was kind of you, and I'm looking forward to show them to my mother. 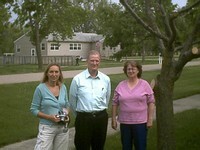 May 25, 2006 we were very happy to host two visitors from Denmark in the town of Gary. Judith Betak, is a journalist for one of the oldest newspapers in the world. The name of the newspaper is Berlingske from Copenhagen, Denmark. She and her associate Karen represent the travel, tourism and aviation section of the paper. They were doing an article on tourism in Minnesota, South Dakota and North Dakota. An item of interest was Laura Ingalls Wilder. Judith was also seeking information on her grandfather Hans Peter Christensen who had lived in the Gary area from 1911 - 1921 and then returned to Denmark. He had maintained contact with some to the Gary area residents. As Judith was searching for information on the history of the area, she found the Gary website and read the Gary Historical Association site and contact information which lead to her contacting us. 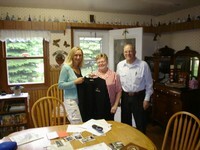 They visited with Bob and Joyce Keimig, Gertrude Baer, and Roger and Sharlotte Baer. Before going on to DeSmet they enjoyed a tour of the area and were given some souvenirs from South Dakota and a sweatshirt donated by the City of Gary.